Texting My Pancreas: #GiveAllTheThings: Diabetes Awareness Necklace. UPDATE: Congrats to Lizzie! You won! I would like to win this for my roommate and I to share. We both have type 1 diabetes. She was diagnosed 15 years ago and I was diagnosed 4 years ago. 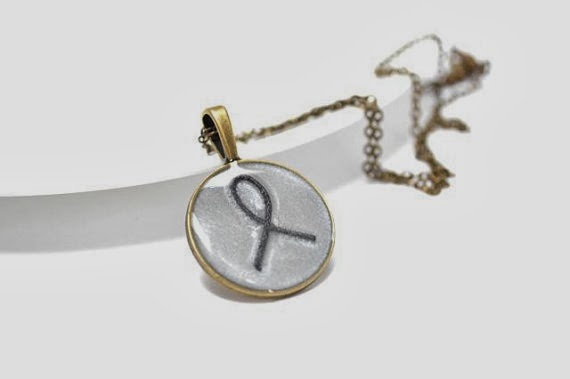 What you can win: A Diabetes Awareness Pendant Necklace, handmade by the mom of a CWD! Here is Cari's description of this piece: "I mixed resin with a faded white/silver background and poured it into the pendant. Once it was set I placed a gray ribbon in the shape of a 'hope ribbon' and then poured another coat of clear resin on top. Each of these pendants is made by hand, from the mixing of the resin to creating the hope ribbon, so no two are alike." To enter today's contest: Use the Rafflecopter widget below to enter today's contest. You can enter today's contest by leaving a comment on this blog post (required) telling me about the person you're trying to win this necklace for (it's okay if it's YOU!). Rules: This contest ends tonight at midnight CST, and is open to all! #GiveAllTheThings contests are intended for people with diabetes (or their caregivers) only. Since the Rafflecopter widget requires you to share an email address, I'll be emailing the winner (as well as announcing them through an update on this post) on Saturday. I would be trying to win this for myself. T1d since 2006. Always trying to as fashionable as possible even if people don't associate diabetes with "cuteness" :) doesn't mean I can't try. I love jewelry So why not wear something adorable and made for a directrixdirectri specific purpose. I haven't had my morning coffee yet. That weird word up there was supposed to be 'very' lol. I am trying to win this for my mom, even though I am the one who has diabetes, she loves wearing diabetes related jewelry. I would like to win this for myself, my daughter is T1 diagnosed 2 years ago and I have been looking for something to wear that would show support for her and this is just perfect. I would love to win this for my sister. She was diagnosed a couple years after me, but she's always been my rock when things spiral out of control. She loves unique, antique-y jewelry, and if it's diabetes related, she loves it more. I would wear this for myself and my parents--over 100 years of T1D between the 3 of us! I'd wear it for me -- going on 25 years of T1D! I'd love to have a reminder of how strong we all are. The person I'm trying to win this necklace for is my daughter. I may be the one with diabetes, but it's my daughter that is strong for me when I need the extra boost. I'd wear this necklace proudly! It's beautiful! I'd wear this with pride! I celebrated my 17 year "diaversary" on Christmas (thanks, Santa) with my beautiful daughter and amazing husband.